I adore the Wild Blueberry White Chocolate Cheesecake from Cheesecake factory and this is my attempt to knock it off. I haven’t had the real version for at least a month so I’m not sure how close it is but I think this is pretty yummy and close. 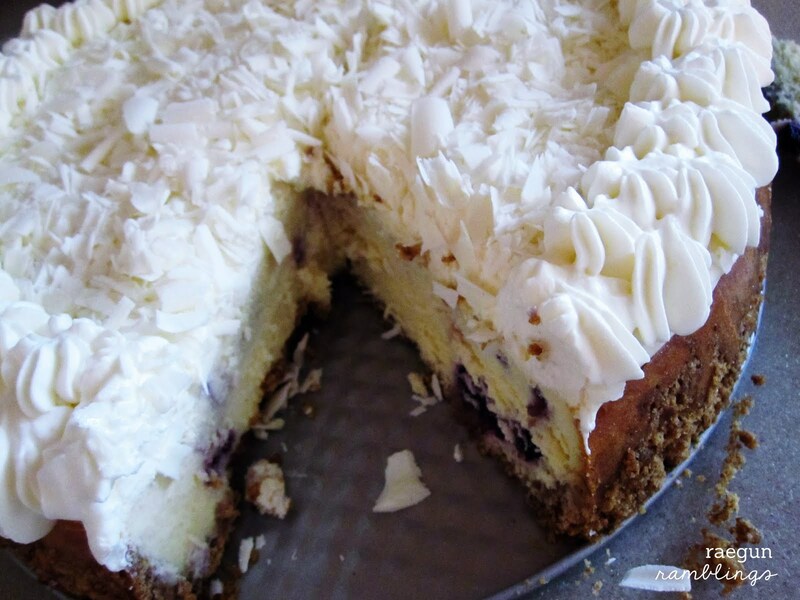 It’s got a graham cracker crust, luscious cheesecake swirled with whole blueberries, and it’s topped with mousse and white chocolate shavings. And if that’s not enough I highly recommend serving it with whipped cream. 2 squares almond bark or white chocolate thawed. Pour half of mixture into springform pan. Add blueberry mixture and top with remaining cheesecake mixture. Mix remaining pack of cream cheese, vanilla and sugar. Whip in cool whip to form the mousse. Using a potato peeler make white chocolate curls. Spread mousse over cooled cheesecake and top with chocolate shavings. You can put whipped cream on the cake but I regretted doing that because I thought it looked way prettier without it. So next time I’d just have it on the side. There are a lot of steps but it’s all pretty easy and way cheaper than paying 7$ a slice at cheesecake factory. Plus it looks so stinking impressive. What flavor cheesecake should I try next? thanks for sharing! I just might attempt this!!! I’m putting in my vote that you try to re-create Eli’s key lime cheesecake next! i looooove cheesecake and this looks delicious! found you on etsy forums, hope you’ll come visit me too! OMG, that looks scrumptious, I am so so very tantalized! I really like the white chocolate raspberry and it would probably be very similar to this. I’m also partial to the chocolate tuxedo one. 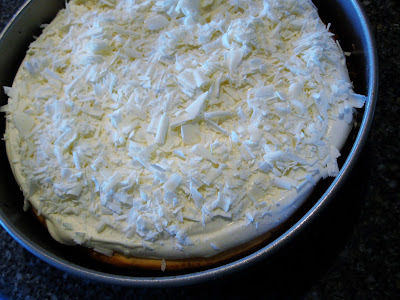 I love making cheesecake, I’m adding this one to my go to recipes, thanks for sharing it. 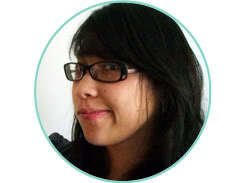 Found you @ The Girl Creative! Oh WOW! That sounds absolutely awesome! I love cheesecake of just about any kind. Holy moly! That looks incredible! Oh my! That looks divine! I love the name of your blog! It looks delicious, I love white chocolate and cheese cake, I will try to make it this weekend..
Oh my gosh – can I come over for a slice of this right now?! It looks and sounds so delicious. Definitely bookmarking this for sometime soon. Thanks for linking up! oh gosh! i don’t even like cheesecake that much and i want to gobble this up right.this.minute. seriously! excellent job! Well. I am in love. It’s official. This looks completely outrageous. I love making cheesecake in the first place, but adding the blueberries and mousse? Forget about it. But then you had to go and mention whipped cream. You’re a temptress. So glad I visited from Tasty Tuesdays! Nice pics! I love blueberries in just about anything. Thanks for linking up to the It’s a Keeper Thursday blog hop! I hope you come back next week and link something new! Oh my, that looks delicious!!!! I like everything in this cake! Very nice and it really looks so delicious. Perfect. Oh wow…this sounds amazing! I could live on cheesecake and I can’t wait to try this. I don’t know how I missed this last month. I JUST had this cheesecake at the Cheesecake Factory today with my co-workers and googled the recipe and found yours. i can’t wait to try it!! I made this for my mother’s birthday and it was insanely delicious. SOOOOO good- thank you so much for this recipe- everyone loved it and I’ll never make cheesecake any other way. Is it Vanilla EXTRACT? I sure hope so! Making it in now! I made this awhile back and it was TO.DIE.FOR!!! My question: I’m headed to the beach with several couples and we are each responsible for one nights meal. I would love to serve this however do not want to be in the kitchen making this while losing time on the beach! Do you think it would freeze well so that I could make it the week before? My sister and I made this and it was AMAZING- the family had it finished off in 2 days!